Millions of pounds of investment by water users, charities and tax-payers are wasted each year by water points failing soon after construction. Getting a more complete understanding of how to keep water flowing from boreholes will reduce waste and improve water services for Africa’s poorest communities. The underlying causes of rapid failure of approximately a third of African rural groundwater sources are complex and multi-faceted, but with interdisciplinary approaches can be understood, diagnosed and ultimately anticipated and mitigated. Water point failure is a long standing problem – around 30-40% of water points, are estimated to be out of action at any one time and this failure rate has remained stubbornly high for decades. An UPGro catalyst study showed that there are many inter-related causes of failure, which depend on context. It is not a simple problem, so simple solutions, such as a new type of pump or more capacity development will not work on their own. To provide a nuanced definition of functionality of water points and water user groups which accounts for seasonality, quality and expectations, and is fit for purpose for tracking future progress towards new Sustainable Development Goals. To apply this new definition to 3 countries, Ethiopia, Uganda and Malawi, carry out field surveys for a statistically significant sample of water points, and relate results to larger ongoing studies of functionality to help update WASH coverage figures. To unravel the multifaceted factors governing source failure and success through detailed novel interdisciplinary science exploring the inter-relations between water point governance arrangements, engineering choice/performance, demographic, and groundwater conditions within a broader institutional and hydrogeological framework. To examine and forecast future rural water supply coverage by modelling the impact on water points of different future pathways, including groundwater recharge scenarios, different development approaches, and future rural water demand scenarios. To develop a dynamic approach for building resilience into future rural water supply programmes, through detailed interdisciplinary analysis of the datasets developed in 1 – 3, publish in a manual, and develop several pathways for uptake within the WASH community. 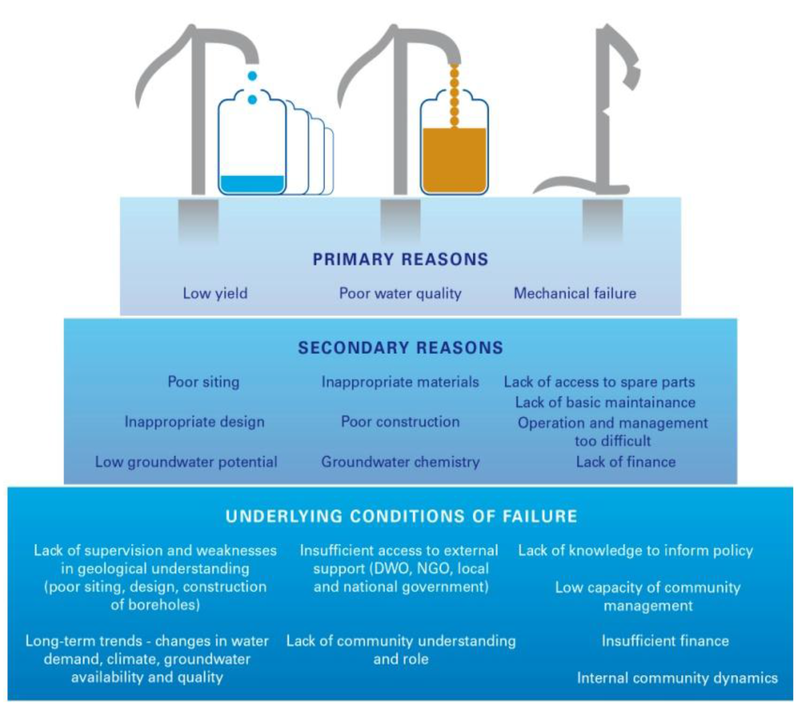 Some of the many primary, secondary and underlying reasons for water source failure. BGS: Prof. Alan MacDonald (PI), Helen Bonsor (PM), Dr Paul Wilson. We would be really interested to potentially work with you to share our knowledge from the field in Malawi or potentially look at planning an event together in the future reflecting on these issues. The project is certainly very valuable and we look forward to seeing the results. I am have to hear that you your project is also working in Malawi. I am a PhD student at Mzuzu University working on similar area on governance and functionality challenges for rural water supply in Nkhata Bay District with Dr. Rochelle Holm and Dr. Mavuto Tembo. I don’t know which districts in Malawi are working? I believe your results will be very important to my study as well. Looking forward to hearing more from you. 1) Corruption. Political donations from large corporations delivers policy that lets gas & coal companies to drain aquifers and pollute surface water.